LRO is keeping an eye on Yutu 2. China’s Chang’e 4 rover, called Yutu 2, moved between Feb. 1 and Feb. 28, 2019. 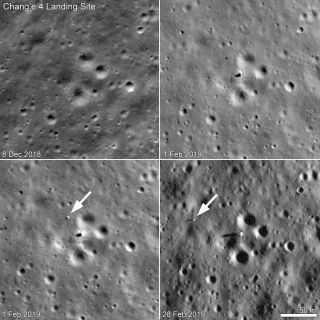 The upper left panel shows the landing site before Chang’e 4’s Jan. 2 touchdown; the upper right panel is the best-resolution photo of the lander and rover taken so far. The lower left image was taken six hours later. The most recent view, in the lower right, shows that Yutu 2 traversed 150 feet (46 meters) to the west during the month of February. NASA's Lunar Reconnaissance Orbiter (LRO) continues to monitor the whereabouts and wanderings of China's Yutu 2 rover on the moon's far side. Over the next few months, the sun will rise higher and higher over Yutu 2's landing site when LRO is overhead, providing the opportunity to obtain images with no shadows, according to Mark Robinson, principal investigator of LRO's Lunar Reconnaissance Orbiter Camera (LROC), a three-camera system that captures high-resolution photos of the lunar surface. Those upcoming images will be particularly useful for mapping differences in brightness (albedo), Robinson noted. Researchers should therefore soon get their first good looks at the "blast zone" — the region that was brightened around Yutu 2's companion lander as rocket exhaust interacted with the regolith, as seen around all other landing sites. The tracks of the rover should also be visible in the coming months, allowing researchers to follow Yutu 2's exact path along the floor of Von Kármán Crater, Robinson explained. Yutu 2 and the lander make up China's Chang'e 4 mission, which touched down inside the 115-mile-wide (186 kilometers) Von Kármán Crater on the night of Jan. 2, 2019. No craft, robotic or crewed, had ever pulled off a soft landing on the moon's far side before. LRO passes over any given place on the moon at least once every month (in the daylight), allowing the westward progress of the Yutu 2 rover to be seen. Robinson explained that, at the end of February, Yutu 2 was 226 feet (69 meters) from its home base, the Chang'e 4 lander. LROC images show Yutu 2 made 150 feet (46 m) of westward progress during the month of February. Each month when LRO images the landing site, now called Statio Tianhe, the lighting changes, providing a different view of the surface. Around dawn and dusk, long shadows enhance topography, Robinson said; closer to noon, differences in surface brightness are more apparent. In the latest LROC image, from Feb. 28, the sun is near the horizon, and the lander and rover both cast long shadows. Leonard David is author of the forthcoming book, "Moon Rush: The New Space Race" to be published by National Geographic in May 2019. A longtime writer for Space.com, David has been reporting on the space industry for more than five decades. Follow us on Twitter @Spacedotcom or Facebook. This version of the story published on Space.com.